You are using two smartphones, but you hate to carry both devices with you all the time? Today we have a great announcement to make! We’re releasing a new app: mysms mirror. This app is an extension of the mysms phone app and will help you to manage the SMS conversations of your two smartphones. Many of our users told us they struggle to stay on top of their messages on a daily basis when using multiple phones. If you have a look at our forum, you’ll notice that it is also the most requested feature to use mysms on two different phones (maybe you even belong to the group of voters). With this feedback in mind, we decided to find an easier way to keep track of text messages. The result is an app that concentrates on one main feature – displaying text messages from one phone to another. mysms mirror allows you to better manage your texts when using two phones. You’ll be able to read and write messages using different phone numbers from one single smartphone. And it’s not only limited to text messages, as we’re going one step further and will add notifications for missed calls in the next version. So no matter if you are using a business and a private phone, or if you just want to save on costs by using different operators – mysms mirror will help you to simplify sending and receiving text messages. You can be sure you won’t miss an important message or call, you will always have the right phone with you. 1) Install mysms on your Android phone or iPhone you want to mirror and create a mysms account. This will be the account that you use to mirror your texts. 2) Install mysms mirror for your Android phone or iPhone to display your messages on your primary phone and log in with your previously created or your existing mysms account. 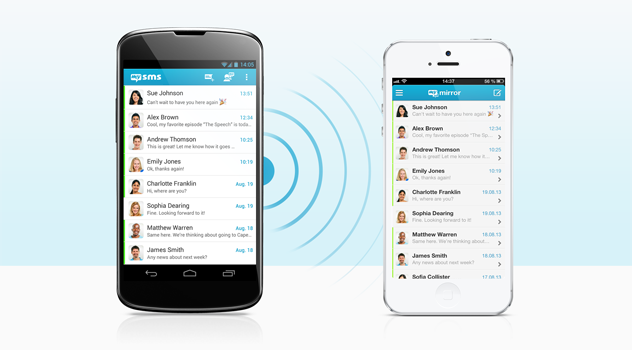 Stay up to date with mysms mirror, if you use two or more smartphones. For Android we offer a free trial of 30 days ($9.99 for unlimited usage), so start testing right away and let us know what you think about it in the comments! Update October 9, 2014: Starting today we are introducing a new Premium model that will be different to the Premium that we presented in this post. mysms mirror is one of many features that is included in the newly introduced Premium offer. Find more information about mysms Premium here. Our native Android tablet app is available! Let’s say I have Phone A and Phone B (both Android). I purchased Premium on Phone A, but I want my texts from Phone B to be forwarded to Phone A. Right now, I am not able to do that because Phone B # is not Premium. Please advise. Surely I don’t need two premium accounts for this to work. Yes, I contacted Customer support and they are helping me, thank you so much! It’d be really cool if BOTH of my phones could forward texts to my tablet. I’m not sure how many people have this use case, but I’d love it. Great that it’s working now for you. And thanks for you feedback! I can’t seem to get the MYSMS Mirror to work. I think I have the same problem as previous post, but I’ve tested it both ways and it doesn’t forward the texts. I’d like to set it up so texts can go from Phone A to Phone B …. and … from Phone B to Phone A … even if I have to register both phones. Is this possible? Please be specific when posting a reply that has an email address. I have phone A (my teenage son’s phone) already equipped with the mysms app, can I mirror his texts to phone B (mine- I’m his mother) without him knowing once I download the mirror app. I have the login info for mysms on his phone, I’m just wondering if an alert will be sent to him, or his permission will be requested or if my texts from phone B would inadvertently be sent to him on phone A. Thanks. If you install mysms mirror on your phone, your son won’t get any notification about this – but you can see the messages, which are sent/received from/on his phone. Thanks for your mail! What’s your registered gmail-account? the normal mysms phone app. We are running a small online business and need to use 5 android phones for 5 different human customer service (or operators), because of the quantity of messages that we need to respond each minute. Is it correct if I apply these schemes of work? Written below. 1. I set mysms as the default messaging system and use one phone number to receive all the customer messages. 3. If 10 messages coming in on the primary number, the 10 messages will be synced too to the other 4 secondary numbers. Then each operator needs to read and respond to one of 10 messages at the same time. In order to get this work properly, they will need the messages synced sooo well. So that once one operator click a sms to respond, the other operators will see that that sms has been read and under response process, so they will take another sms to process. There are my questions. Is it correct, the steps I want to take (elaboration above)? And are you sure that the SMS between 5 android phones (1 primary number and 4 secondary different numbers) will sync perfectly so that we can prevent the event when two operators working at the same sms? I need to know that the SMS which is read will be synced to the others, perfectly synced that has been read and under process, just like the process between phone and PC where the phone use mysms as the default message app. If that is what mysms offers, then I would definitely buy this premium purchase. Normally it should work, if the data connection is stable. But if you start a premium subscription you have a 14 days trial phase. I now have a work phone and want to use this app for two iPhone’s but it won’t let me download. could I get some assistance please? this app would solve the problem of having to carry two phones.